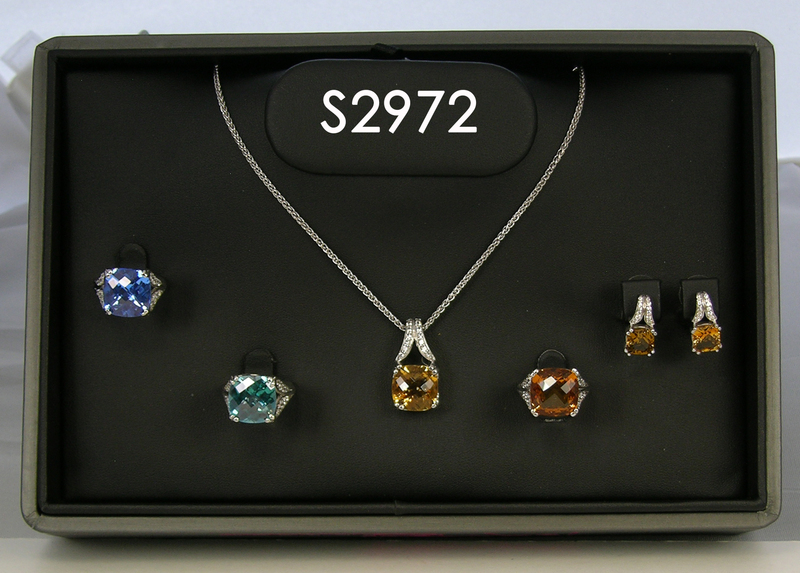 This Sterling Silver suite features a Citrine set, including a Pendant, Ring and Earrings. The pendant (MSP2972/WS/CIT) includes an 10ct Cushion Stone and .28ct White Sapphires. The earrings (MSE2972/WS/CIT) include an 2ct Cushion Stone and .18ct White Sapphires in each earring. The ring (MSR2972/WS/CIT) includes an 10ct Cushion Stone and .40ct White Sapphires. The set shows additional rings in Kashmir Blue Topaz and Caribbean Blue Topaz, Frank Reubel Designs Signature Stones.